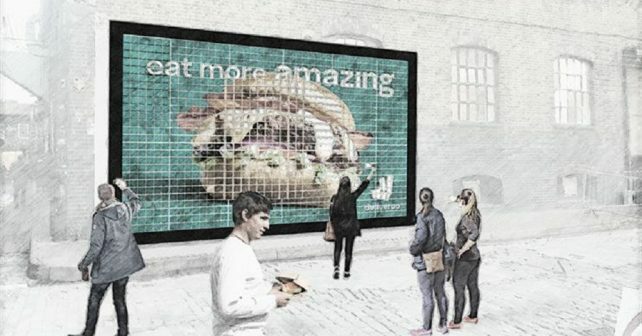 FREE burgers from an edible billboard – we’re in! Just when you think you’ve seen it all, along comes a giant edible billboard of burgers! The double-decker bus sized advertising hoarding is going to be in Shoreditch (where else) and will be four metres high and six long. Composed of rows and rows of the things, hungry Londoners are expected to flock to Truman Brewery to stuff their faces as they’re FREE. Exactly how it’s all going to work we we know not (ladders? ), but It’s all part of Deliveroo’s “Eat more amazing” campaign celebrating the Great British takeaway. There’ll be different brands on board for the one-day event from some of the delivery chain’s highest profile partners and in addition to beef, there’ll be veggie burgers and chicken. So just rock up, eat and take the insta pic!